We will be kicking off our Snap! Raise fundraiser on Friday. Snap uses the power of social media with a safe, fun, and interactive approach to fundraising. All we ask is that each parent/guardian help their athlete gather 20 or more email addresses of their biggest fans. 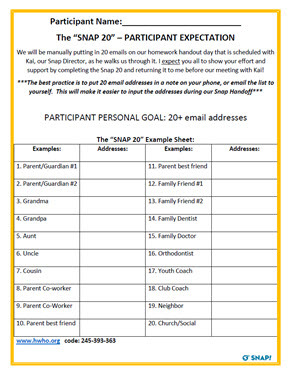 The “Snap 20” sheet below provides examples and areas to write down the addresses. Your contacts are strictly private and protected. 1. Safe and Protected - Snap! Raise is the safest online platform available. All data is private and never redistributed, saved or used when a fundraiser ends. 2. No Product Sales - athletes sell no product through the platform! Every effort is made through our own custom built program enhancement page and shared via Email, Facebook, Twitter and Text. 3. Email Strategy - all supporters will receive a receipt for their donation. All gifts are tax deductible and include a personalized thank you from the athlete. There are three reminder emails sent to donors, with an option to unsubscribe. Please help your daughter gather the 20 email addresses on the attached form and return them to Coach Britt or Coach Morgan at practice on Wednesday evening. They can also save these contacts in their phone to make input easier on Friday. The girls will meet the coaches on Friday at 4:15 wearing their practice pennies and will participate in making a short video for the fundraiser. They will use their cell phones to input the email addresses to the fundraising site. Emails to the contacts will then be sent out with the short video. We hope this will be a successful fundraiser with all participating. 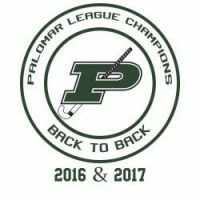 If you have any questions after watching the lacrosse video, please contact Lesley Flud at flud7@san.rr.com.